Maradhi Manni: A Small Replica Of The Grand Canyon Of The U.S. In India! A Small Replica Of The Grand Canyon Of The U.S. In India! The river Pennar has created this gorge in Kadappa, Andhra Pradesh through the years. We had been to the U.S., a couple of years back and visited The Grand Canyon over there and I did a post on it too here! The place was amazing. There, the Colorado river's flow/force, made the designs in the mountainous route it flowed. Here, in Andhra Pradesh's Kadappa, Pennar river flows through the rocky/mountainous region and has created beautiful designs on the red granite rocks. Until we visited here, I hadn't heard about it before. To look at this gorge, we have to climb uneven rocks. I too climbed up to some level and took some pictures! This picture was clicked by me from a bit lower level! The red granite rocks give more beauty to the area. My son climbed up on the uneven rocks which looked as if they were piled up on each other and took beautiful photographs. 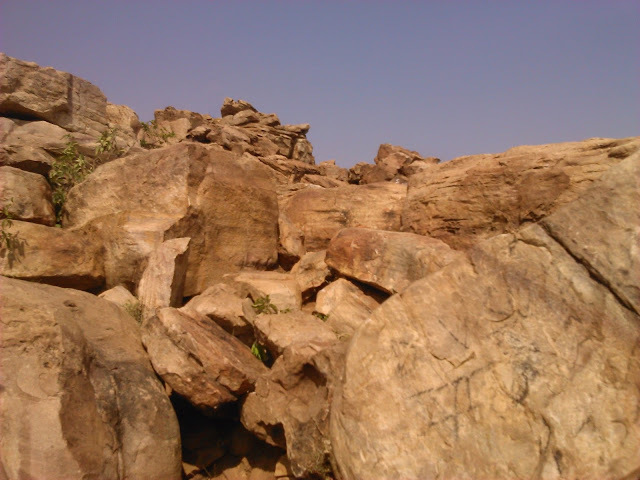 Son climbed up these rocks and clicked the first picture from the top most rock! It was like a rock climbing sport! Now, let me tell you a little history of this gorge. 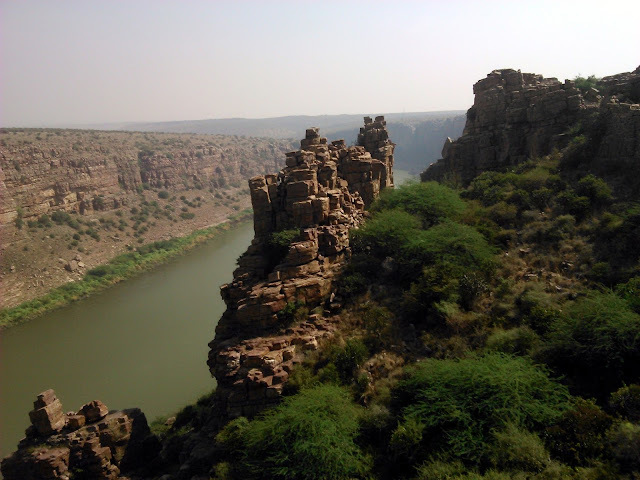 Gandikota (Gandi means Gorge and Kota means Fort in Telugu) is a small village on the right bank of the river Pennar, 15 km from Jammalamadugu in Kadappa district, Andhra Pradesh. The gorge, which is a natural one, forms as a protective barrier on one side of this fort. The mountains are around 300 ft.above sea level. The fort was built by the Chalukya in 1123 A.D. by Kapa Raja of nearby Bommanapalle village and a subordinate of Ahavamalla Someswara I, the Western Chalukyan king of Kalyana. More details can be had from this video and wiki link. To reach this place we have to go through the zig zag route inside the Fort (I saw this type of zig zag routes inside the fort in other forts we visited earlier too, to cut the speed of the enemy troupes). Our car went up to a km. inside and then had to stop. Then we climbed up the rocky area and visited the old Jamia Masjid. Walked further through the rubbles of the old remains of the ancient buildings. The whole area was uneven with stones. All were red granite rock bits. It was noon and the sun was high. But we walked. Son had said earlier that he was going to surprise us (we never knew about this place before!) and yes, this was a beautiful surprise for us. So many designs, the flow of the water has created through the years and more will be there after another 20-30 years. I liked the colour of the rock...bright colour. The rock/stones were seen all over the area. They look sort of beautiful. These temple-like structures were seen in the Grand Canyon too! Water force has created this through the years. But now, the river looks so calm! Monsoon was not good this year too! Nearby airport is Hyderabad and then we can take taxi. We went by road from Chennai, stayed at Kadappa and visited this place. You can stay at Haritha Resorts at Gandikota, run by Andhra Pradesh tourism. We visited Belum caves after this, another nature's wonder. 2 hours' drive from Gandikota! Our India has got many treasures! Thanks for introducing this replica. Never heard of this until now. SG: Thanks for the first comment, SG! Corrected the mistake:) Thank you! Yes, I had never heard of this place before . It was really beautiful, more so, because of the red granite, I felt. The last three pictures are amazing. This place deserves to be highlighted a bit more. Thanks for writing about it on your blog, Maami. DESTINATION INFINITY: The place is really beautiful, Rajesh! Worth taking effort to visit. Lovely shall try visiting next year !! This is absolutely amazing place to be discovered more… I remember seeing this place in a travel show, maybe in the late Sutrula Vanga at DD podhigai. But you got truly marvellous images on the gorge! RENU: Yes, Renu! We don't give importance to our own treasures! SHILPA CHANDRASEKERAN: Please do, Shilpa! JEEVAN: Yes, it looked beautiful! Thank you, Jeevan! Happy New year to you and your family! Been from andhra I don't know about this place. Looks lovely sandhya. SARITHA: This place is not familiar to many people, including us, Saritha! A beautiful place! sm: Thank you so much, sm! Our wishes to you and your family too! Nature, the sculptor has displayed his expertise in these sculptures too and the smae reveal His proficiencyhere. Lovely! I didn't know about this. Looks so magnificent. Thanks for sharing. Happy 2017. RUDRAPRAYAGA: Thank you, Rudraprayaga When you stand there and watch and think about the force of water creating these designs, we feel overwhelmed! SHANX: Welcome to my space, Shanx! Thanks for the wishes and our best wishes to you and your family too! Even we and many people have not heard of this before. I feel I was lucky to go there and watch this magnificent creation of nature. This is simply awesome. The photos are great. So good that you were able to visit this place, Sandhya. I too feel promotion of lovely places that we do have in our country is nil. SHAIL MOHAN: Yes, felt very sad noticing the beauty of the place and not a single tourist was there to enjoy! It was deserted...no proper roads too. Who will take action? I will settle for this instead of dreaming about Grand Canyon! ZEPHYR: We were there staring at this place in the scorching sun for a long time! Beautiful place. It is not that difficult to promote this place. Thank you, Zephyr! Pl.ask Vineet to promote this place.